Although the World Health Organization (WHO) recommends breast-feeding alone for the first six months for your baby, usually by that time your baby will gravitate towards solid foods. 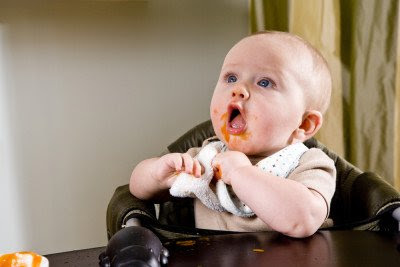 There are two thoughts on feeding solid foods, one is baby-led weaning (where your infant eats from your plate), the other is puree (which is basically mush and helps ease baby's towards more challenging textures). This article provides information on seven solid foods for your baby. You can read the complete article here. I hope you found this article on 7 solid foods to introduce to your baby to be helpful.. If you are looking to find a baby carrier, it would be appreciated if you would check out my store. We offer Hotslings Adjustable Pouch, Rockin Baby Pouch, Rockin Baby Ring Sling, Seven Everyday Slings, and Lil Cub Hub Convertible Baby Carriers in a wide variety of fabrics and colors. Thank you for visiting my blog and hopefully also my website. Prices have recently been reduced on all products.